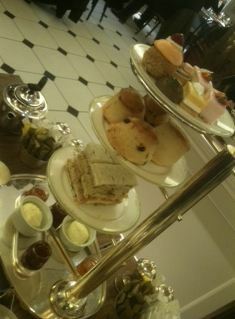 I went to Harrods for afternoon tea unannounced. I specify now that it was unannounced because it sets the scene not as some PR-organised, carefully orchestrated tea where I am specifically singled out as a blogger but as an afternoon out with friends. When we were seated great care was taken to ensure our comfort and yet all was not as I would have expected. The table was not well-laid. It was OK but not great. The teapots when they were placed were OK again but not great. The tea was OK but not great. 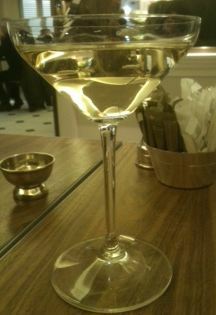 I ordered champagne which was fine. When we ordered the tea, the waitress was really wonderful, helping us choose and also advising us to only order 2 and not 3 helpings. When the tea became over-brewed and bitter the waitress replaced it with a full fresh pot – perfect! While the waitress was perfect, the tea itself was not. I am not pedantic but in Harrods I expect them to be able to line plates up on a riser properly. They weren’t. I expect the scones to be warm and the clotted cream to be cold. They weren’t. I expect the scones to be baked properly. They weren’t. I expect the sandwiches to be fresh and cut neatly. They weren’t. I expect my choux pastry to be cooked lightly but completely without that crunchy, hard crust and so many other things about my food to be done correctly and they weren’t. Now, it could clearly have been an off day or there could have been a problem or there might have been something else going on. As a blind visit which I was not expecting to review, I was disappointed beyond words. 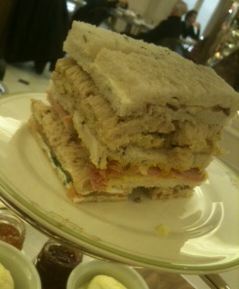 Would I recommend Harrods to a client or a friend for a tea to impress? Right now, I wouldn’t. I apologised to my friend whose birthday it was and I continue to feel guilty for taking her there and I shouldn’t. I think the trouble with places like Harrods is that they just get punters in on the name so don’t have to try too hard. I think things have improved now, but I remember going for tea at the Ritz as a birthday treat in the 80s and it was so very disappointing.